The Retro Hipster look likes soft vintage looks. Grooming is also well thought out, as reflected in the photo above. Day wear includes statement coats or jackets but with a soft tailored look about them. A slightly softer pallet includes creams, soft greys and warm colours that pop, such as the burgundy. The softer edge would follow through to accessories like a scarf. For summer vintage Tees and neat vintage denim in a brand like Levi’s or on trend ripped jeans depending on taste would be a must. 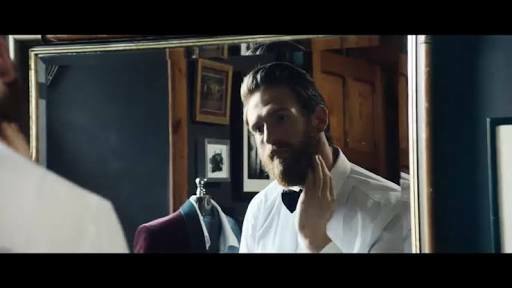 The evening wear in the ad is more upper end, adding the use of bow ties kicks it up into the luxe and ‘buttoned up’ etiquette. For the hipster look a dinner jacket and pants are chosen. The dinner jacket is a vintage velvet in the Jewel tone of burgundy, making the jacket pop and a standout feature of the outfit. Shoes for the evening look are a a classic black in soft leather.